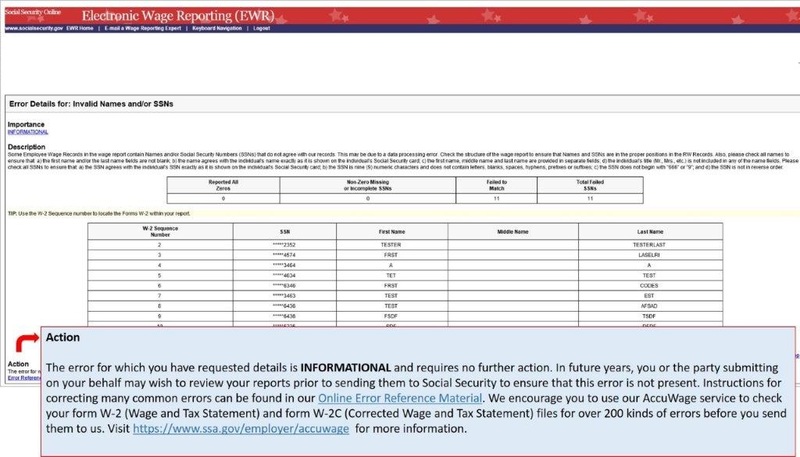 If you received an Employer Correction Request (EDCOR) letter concerning name and SSN mismatches for your employees, please review the Business Services Online (BSO) Employer Report Status section to access your detailed error reports. When accessing the Error Details that displays the mismatched names and SSNs, you will see an Action message at the bottom of the screen indicating that no further action is required [See Example]. We ask that you please disregard this message and proceed to follow the instructions listed in the Description of the error report and please submit necessary corrections on the Form W2-C.
For more information and resources, including how to register for a BSO account, please visit the EDCOR landing page at www.ssa.gov/employer/notices.html.